34 year old Chris Cook from Putney, is participating in the London 2 Brighton Challenge 2012 Ultra Marathon, as part of team Hunger – in support of The Hunger Project. Chris, whose most recent extreme sporting experience was turning up to his brother’s wedding by helicopter due to a timing clash with Uni exams, is participating in this 100KM Ultra Marathon on 12th and 13th May as a team effort, and with the endorsement of his employers, Practical Law Company in London. According to Chris: “I am really proud of myself for pushing my own limits within this team effort. Any success story is about people coming together to make great things happen and participating in the London 2 Brighton Challenge is no different. From a personal perspective I have recently been focusing on getting fit and healthy at the gym so this Challenge is a celebration of my overall lifestyle shift. He continued: “I am moved by the work undertaken by The Hunger Project and am so grateful to my employer, Practical Law Company, for backing me all the way to the finish line. An end to World Hunger is possible and I am taking my own steps towards making this global shift happen. Perhaps within my lifetime,” concluded Chris. So what is your New Year’s resolution this January 2012? 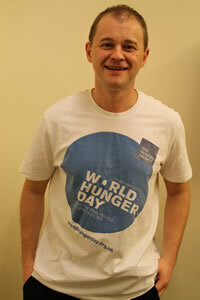 Why not follow Chris get fit with a social purpose and help eradicate the footprint of global hunger with The Hunger Project UK, by signing up for a London2Brighton Ultra Marathon Challenge in support of The Hunger Project, taking place on 12th and 13th May 2012. All participants walk 100km over two days from London to Brighton and those who raise over £1000 for The Hunger Project will also be eligible for two complimentary tickets for World Hunger Day 2012’s musical extravaganza on May 28th 2012 – headlined by Dionne Warwick & Friends and taking place at The Royal Albert Hall London. According to Tim Holder, UK Country Director for The Hunger Project: “I am delighted that The Hunger Project has joined forces with The London2Brighton Challenge this year, building upon our 2011 successes. Literally, an amazing feat thanks to many feet! Being the year of a British-hosted Olympics, there is a natural synergy to extending our fundraising offering this year to sporting activity, in addition to staging a bigger and better World Hunger Day 2012 Musical Extravaganza, frontlined by the hugely supportive Dionne Warwick. What we achieved in 2011 proves, without question, that we might be a relatively small charity but have huge energy, vitality and drive – all skills that are akin to what is needed to complete any sporting challenge. Tim continued: “I would like to thank in advance all those participating in this amazing London2Brighton Challenge on our collective behalf. See you in May! - even if you aren’t up to the run on this occasion, please WALK ON BY and support our fundraising team en route from Surrey to Brighton. Every supporter counts in our quest to end poverty and hunger. For good."